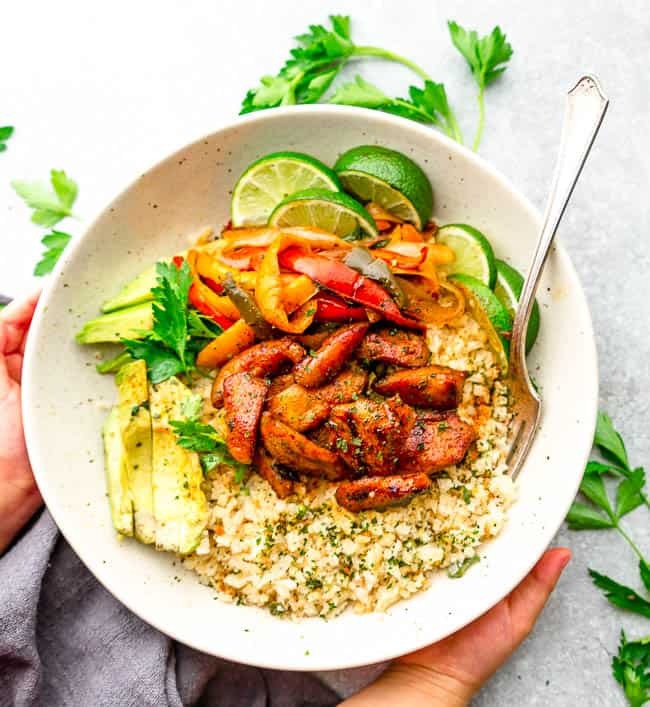 Keto Burrito Bowls are made with tender marinated chicken and low carb vegetables served over cauliflower rice. This is an easy 30 minute dinner recipe that is perfect for meal prep. We are big fans of Mexican inspired dishes at our house. Especially when you serve them in bowls – taco bowls, fajita bowls and burrito bowls – we love them all! To make traditional burritos low carb and keto friendly, we’re going to swap out the flour tortillas and serve the marinated chicken and vegetables over cauliflower rice. The chicken cooks up tender, juicy and flavorful and the whole meal comes together in around 30 minutes. 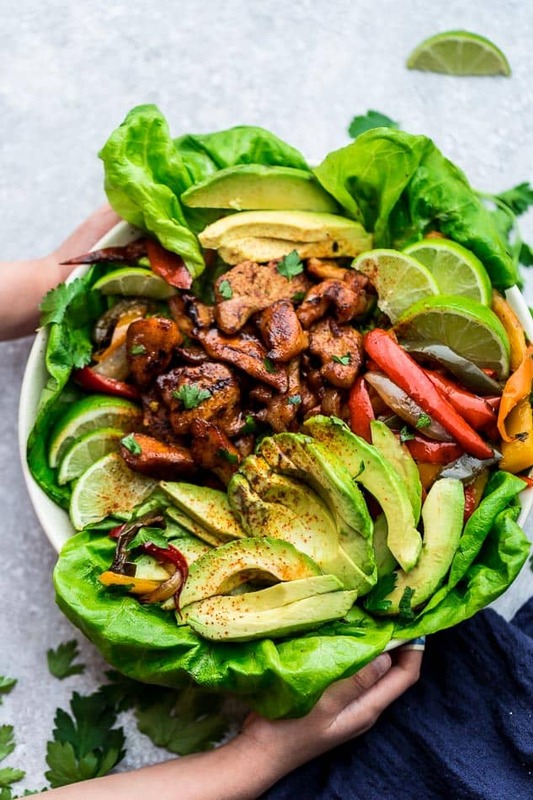 These Keto Burrito Bowls are full of flavor and seriously so simple to make. The best part is, that you can easily customize the vegetables with what you have on hand. Making your own low carb burrito bowl means you can skip that long Chipotle take-out line at lunch. Homemade burrito bowls are not only cheaper but they are so much better for you than Chipotle’s Burrito Bowls. The best part is, you can pile on as many toppings as you like, including all the guacamole – and save a ton of money. 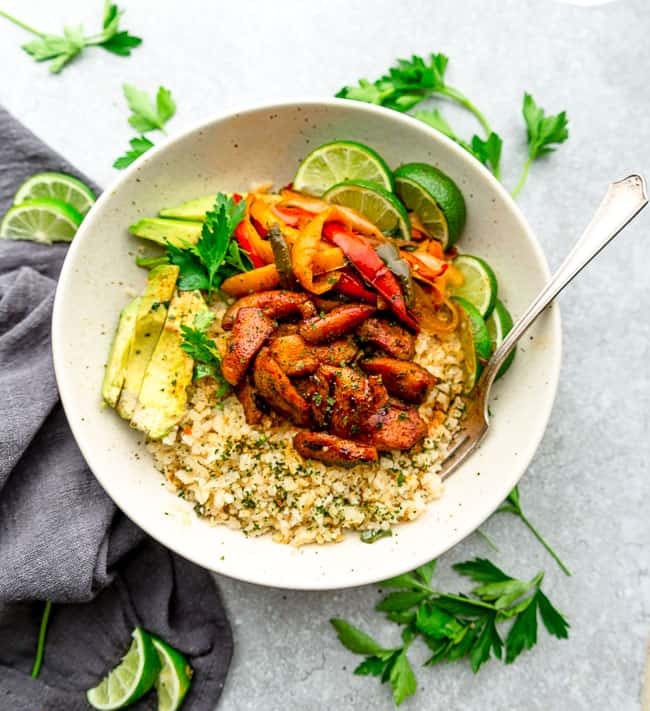 These Paleo Burrito bowls are also naturally gluten free, Whole30 friendly and make a delicious sugar free lunch or dinner option. Typical burrito bowls include all of your favorite burrito fillings served in a bowl instead of wrapped in a tortilla. Chipotle typically serves their burrito bowls over cilantro rice, with beans, corn, lettuce, pico de gallo, guacamole, sour cream and cilantro. 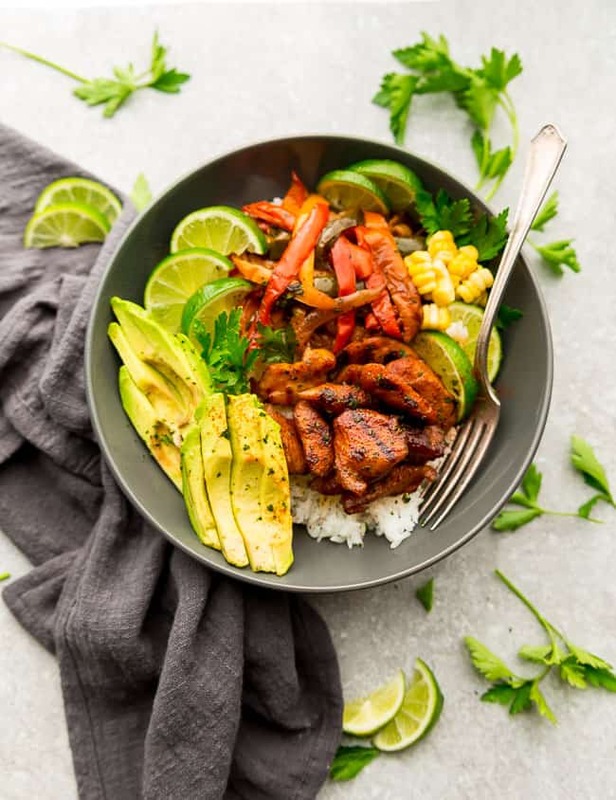 Since we are trying to make burrito bowls that are low carb and keto-friendly, our low carb chicken burrito bowls ditches the high carb beans, corn and white rice. 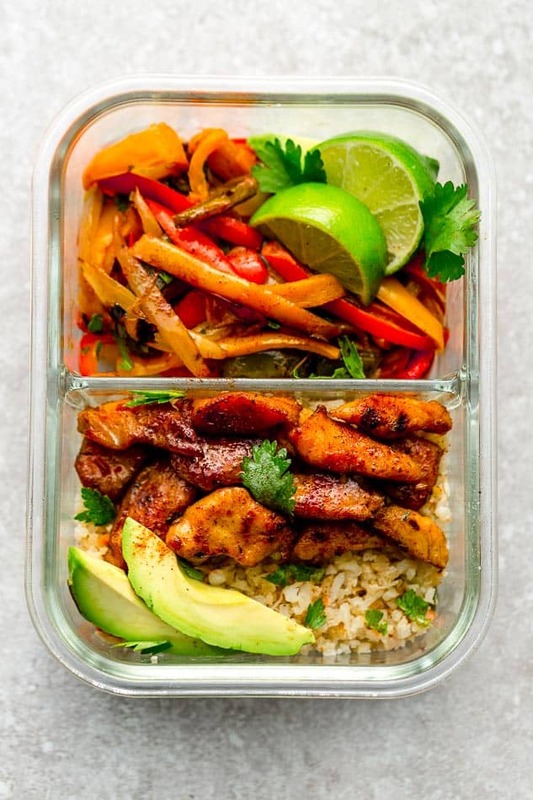 Everything comes together in around 30 minutes and is perfect healthy dinner or lunch the next time you’re craving Mexican food. WHAT INGREDIENTS ARE IN A BURRITO BOWL? Another great thing about making your own healthier versions of restaurant favorites is that you can customize them with any other vegetables you have in your fridge. Don’t have cauliflower rice on hand? Simply serve the chicken and vegetables over some romaine lettuce, with low carb tortilla or coconut wraps for low carb burritos instead. Want a vegetarian burrito bowl instead? Use tofu, tempeh, black beans or lentils. Not a fan of chicken – swap with steak, pork, shrimp or fish. 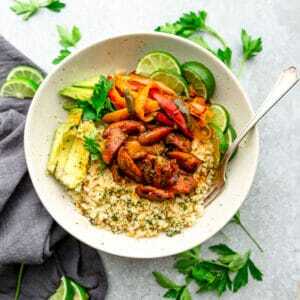 MARINATE THE CHICKEN: To make low carb burrito bowls, you’re going to start off by seasoning the chicken. 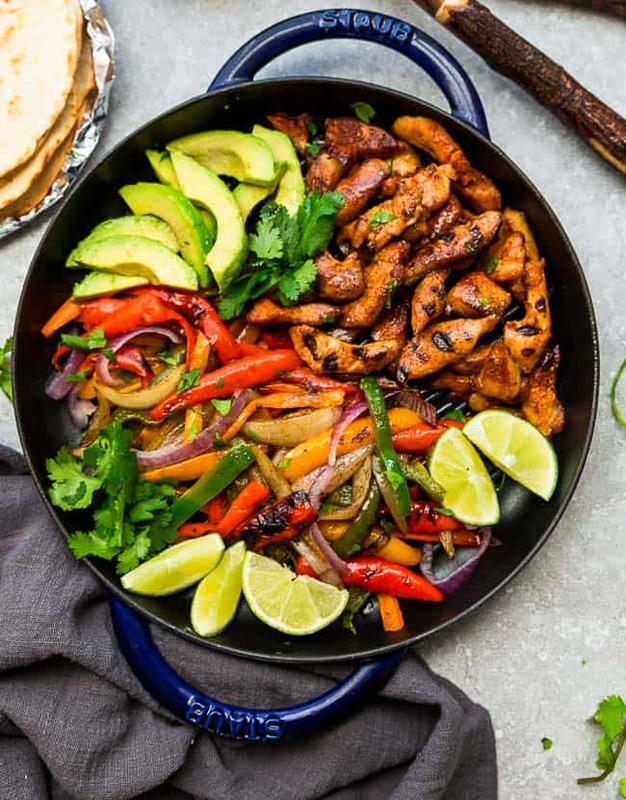 We use our favorite homemade fajita seasoning mix with a cilantro lime marinade. Let the chicken sit while you get your other ingredients ready. PREPARE THE VEGETABLES: Slice the onions and peppers then saute in the skillet. We used a mix of red, orange, yellow and red bell peppers. COOK THE CHICKEN: Brown the chicken in a skillet and layer on cauliflower rice, lettuce or these coconut wraps. ARE LOW CARB BURRITO BOWLS GOOD FOR MEAL PREP? Yes, burrito bowls are great for your next Sunday meal prep. Divide everything out into lunch containers to enjoy them throughout the week. Since our burrito bowls are packed nutritious vegetables, protein and no questionable added ingredients, they are perfect if you’re following a healthy and balanced lifestyle. Our Whole30 burrito bowls are also dairy free, gluten free and diabetic friendly. If dairy is not a concern, you can certainly top your burrito bowls with cheese and some sour cream. Combine all the ingredients for the fajita seasonings. Reserve 1 1/2 teaspoons for the bell peppers. In a medium bowl, combine 1 tablespoon of olive oil, chopped cilantro, lime juice, mustard and 5 teaspoons of the fajita seasonings. Reserve 1 tablespoon of the chicken marinade for drizzling on the chicken at the end. Pour remainder of the marinade into a large zip-top bag along with the chicken. Press the bag to evenly distribute the marinade and allow to sit while you prepare the vegetables. Slice the the onions and bell peppers. Heat 1.5 tablespoons oil in a 12" skillet over medium high heat. Add the onions and allow to cook for about 5 minutes, or until softened and fragrant. Add the bell peppers and sprinkle with the reserved 1 1/2 teaspoons of fajita seasonings. If you like the peppers with a nice crunch - cook for about 3-5 minutes. And if you like them softer, leave them on for about 3 minutes longer. Transfer and set aside on a plate. Melt remaining oil in the same skillet and brown the chicken. Cook for 5-6 minutes, or until cooked through. Add the reserved chicken marinade to the skillet and cook for an additional 30 seconds. Remove from heat. Serve over some lettuce, cauliflower rice and with sliced avocados and lime wedges. i JUST HARVESTED CAULIFLOWER FROM MY GARDEN AND THIS IS THE PERFECT RECIPE. IT WAS DELICIOUS THANK YOU!